A few years ago, our season tickets were near the top row of the northern end zone. As one OOC easy victory winded down, we started to leave. The stands were quickly clearing out, but I saw a father and son still in their seats, in Auburn jerseys and hats. As they watched, the father was explaining the game to his son. To many of us, this was a rest stop between important games and an excuse for an early escape. 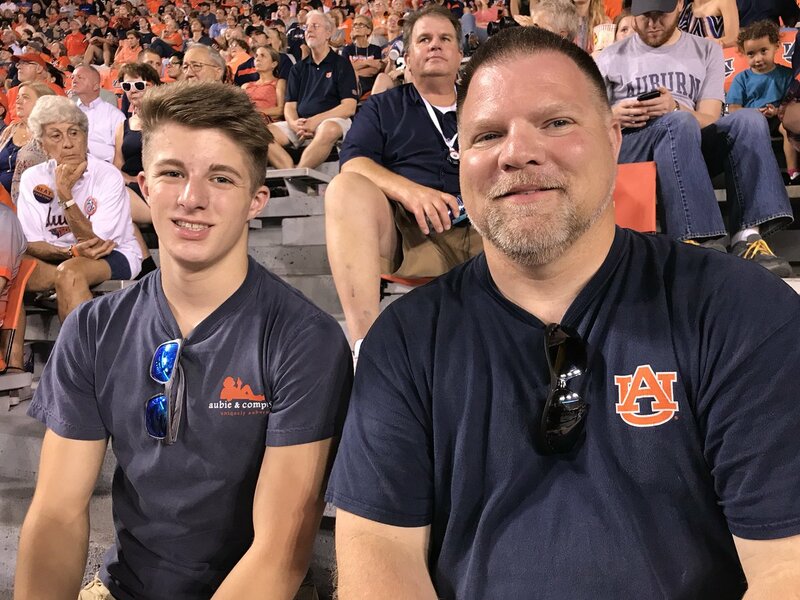 My guess was that for these two Auburn fans, it was their best chance to get affordable tickets, and a moment that they were going to share until 0:00. Now, during at least one of those games, I like to wander our section and see if I can find some fans like that. College football has become a high-ticket juggernaut all around, pricing itself out of reach of many fans. But these fans came to watch Alabama State, and they shared a moment. I’d like to introduce you to a few of them. This is Burt from Leeds and his three kids. Mom is at home; No. 4 is a month away. 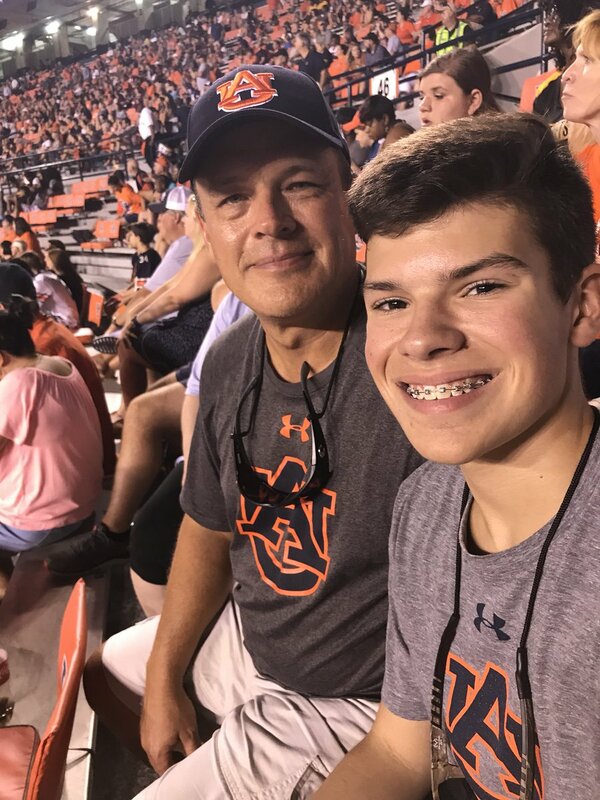 Burt has been coming to Auburn games since he was 7, during the Pat Dye era. His father worked with coach Rodney Garner’s father. Burt and his kids also brought good luck. I was walking to the game as I met him, and we scored a ride on a cart. That also meant they got there in time to see the eagle fly. This is Tony (right), his brother, Devin, and their niece, Shay, from Notasulga. Tony sat in front of us and had a great time talking football during the game. He got his tickets through a friend who was working the game. That is a Notasulga jersey Devin is wearing. He told me that he is a fan of both Auburn and Alabama. Good luck with that. This is John and his son, Max, from Prattville. John got his tickets through his boss. They might have moved down from the upper level to these seats. Note the matching Auburn t-shirt/sunglasses combo. Sharing Auburn style to go with their Auburn fandom. This is Chris, from Canton, Georgia. He brought four young ladies with him. His daughters are on the outside; his nieces are the two on the inside. Chris had just made a major investment in cotton candy. 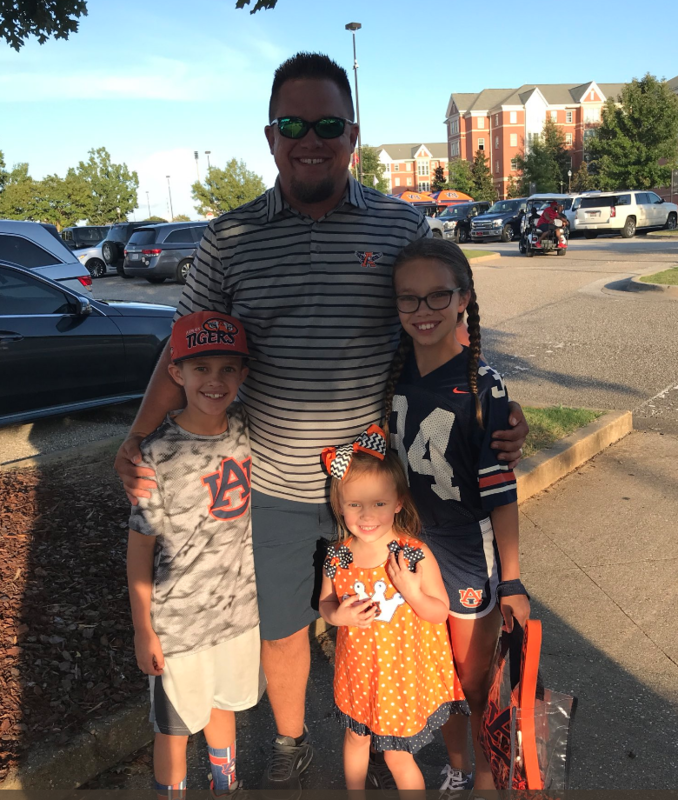 It was the nieces’ first Auburn game. When the older one heard I taught journalism, we talked writing for a while. We might have recruited an English major. Make that two — his daughter sitting between us is a reading fanatic. This is Daniel and his son, Dawson, from Heflin. Daniel also got his tickets through his boss. Daniel is an Auburn fan, but his sport is basketball, so we also talked Bryce Brown and Austin Wiley. While I was talking to them, Auburn fumbled a punt that led to Alabama State’s only touchdown. I feared my project was bringing bad luck, but Daniel assured me that the game was well in hand. I also talked to a mother and son who sat next to me in empty seats early in the game. It turned out they have season tickets, but they gave them to other fans so they could help a friend with her food booth. They were sneaking out for a break to watch part of the first quarter. Hash tag Busted. Disclosure: Given the late starting time and long drive home, not all of these folks made it to the alma mater. 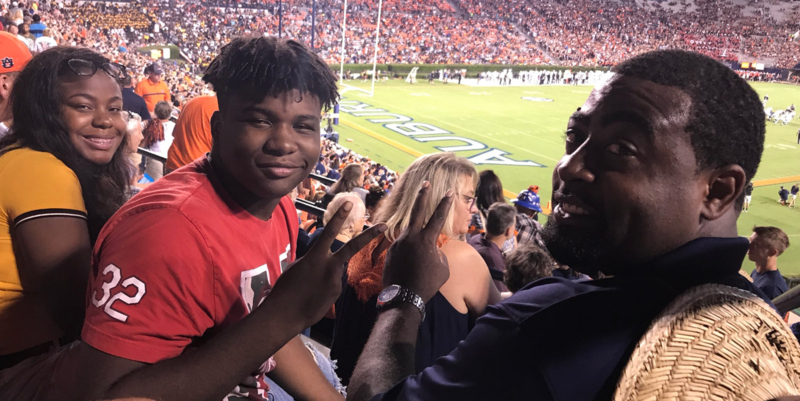 But they were able to spend a day together, sharing in the Auburn football experience and its memorable moments. I have seen several oral histories of the Kick 6, so I thought I would quickly jot down my memories of that night. Add your own as comments, if you’d like. I was at the top of Section 44 with a friend, Christie, who was at her first Auburn football game ever. 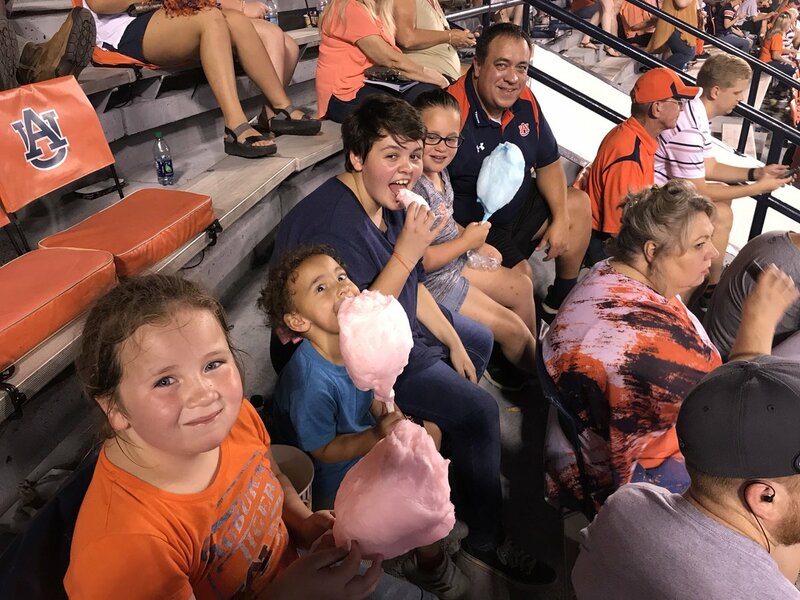 We had seen Sammie Coates catch the pop-pass and run it in, and we had booed with indignation when the officials restored one second to the clock. I watched the attempted field goal, and from the North end zone stands, I had no idea that Chris Davis was back there. Then I realized that he had caught the ball and started running it out. My first thought was, “How quaint. This player thinks he actually can do something fielding the field goal, and he is running fast too.” I honestly thought he would be tackled and we would head to overtime. Davis cut to the sideline, along with everyone else on the field, and when Cody Mandell and Dee Ford crossed in front of Davis, it was like a curtain opening and revealing Davis running toward the end zone with only Auburn players close. 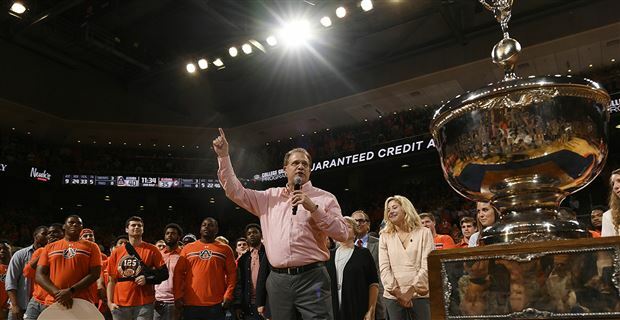 As that curtain opened, it unleashed a roar as a huge wave cascading from all over Jordan-Hare, as I had never heard before, and suddenly we were all going crazy — cheering, hugging, screaming. Our side of the stadium was not allowed on the field, so we got gridlocked in the stands for a while. Like Mike Szvetitz quoted in the Opelika-Auburn News, I could not believe that they played “Celebration.” A 1980 song? Really? For the next couple of days, I heard from relatives who did not even care about football (or so I thought) telling me they had seen the kick and they thought it was great. My favorite was a phone message from my Uncle Mario, age 93, who would pass away the following summer. I realized this was a moment shared not only with the college football world, but also sports fans across the country, a once-in-a-lifetime play. Those of us who were there became fortunate witnesses to history, and were privileged to share in it. I still get choked up seeing Auburn fans who were watching at home or in a restaurant or bar, realizing that the moment was theirs as much as ours in the stadium. The next couple of weeks, Auburn was like Disneyland, the happiest place on Earth. I remember seeing a campus tour pass in front of Tichenor Hall that next week, and everyone was gazing around them in wonder. All that was needed was cartoon birds carrying “Welcome to Auburn!” banners and tour guides dressed as Snow White. I realize we are mocked, often from another side of the state, for continuing to celebrate this moment. But that’s what sport is about: the opportunity to share in such moments, and know that we were there, and that it really did happen.